Jim Hackett: "We must accept the virtues that brought us success over the past century are really no guarantee of future success." 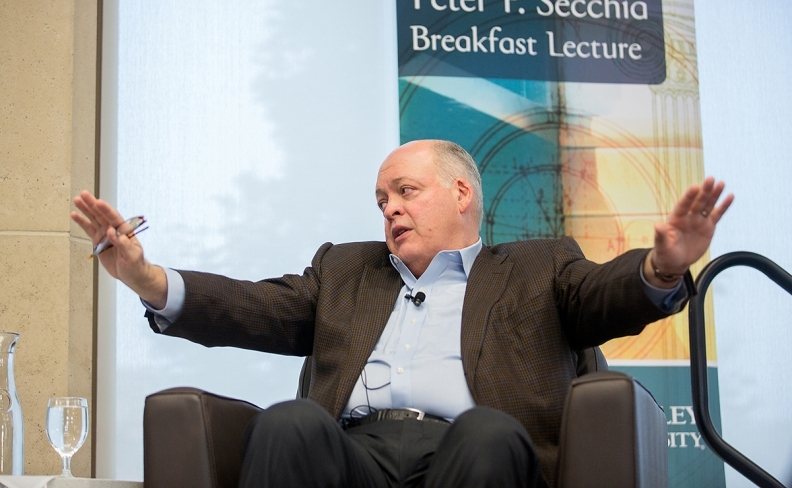 DETROIT -- Ford Motor Co. CEO Jim Hackett on Tuesday outlined sweeping changes that include redirecting a third of the company's internal-combustion engine expenditures to vehicle electrification and cutting costs by $14 billion. He said the automaker would develop new vehicles faster, shift $7 billion in product-development funding from cars to more profitable light trucks and build Internet connectivity into Ford’s full U.S. lineup within two years. The updates are designed to improve Ford's competitive fitness, a term Hackett has used to describe how the automaker must evolve to stay ahead of competition. He said Ford leadership must focus on problems “near, now and far” simultaneously so that the company will be prepared to thrive in the future without losing sight of its current, highly profitable operations. "When you're a long-lived company that has had success over multiple decades the decision to change is not easy -- culturally or operationally," Hackett said. "Ultimately, though, we must accept the virtues that brought us success over the past century are really no guarantee of future success." Overall, Ford plans to reduce the rate of growth in automotive costs by half through 2022. It plans to cut $10 billion in incremental material outlays and reduce engineering costs by $4 billion over the next five years. It will achieve that through utilizing common parts and implementing technology in the design process so it doesn’t spend as much on building prototypes. Ford said it's reallocating $7 billion of capital from cars to light trucks. Earlier this year, Ford decided to move production of the next-generation Focus sedan from North America to China, saving money. The automaker said that shift in spending on light-vehicle development would result in fewer car nameplates but did not provide specifics. It did not say it would exit any vehicle segments, but rather that it would continue in a more focused, reduced manner. Jim Farley, Ford’s president of global markets, said the automaker would target what utility vehicles it offers to specific markets. For example, he said Ford was planning multiple utility vehicles in North America in the “authentic, off-road, capable” category, or offering larger, three-row SUVs in places such as China. On the car side, Ford will focus on higher-revenue sub-segments, such as hatchbacks or performance variants. Farley also confirmed that Ford’s 2021 autonomous vehicle will not be a Fusion sedan, the midsize car on which it has been testing the technology. Ford has said that the key to autonomous vehicles will be high utilization rates. “The best model to do that is to have a diverse group of business and services to utilize the vehicle all day long,” Farley said. That could result in more partnerships. Ford recently hatched deals with Domino’s to explore autonomous pizza delivery, and with Lyft to eventually deploy autonomous cars on its network. It also plans to simplify what vehicles customers can order. Ford said the team has identified a more than 90 percent reduction of orderable combinations in the next-generation Escape. In addition, it's moving from 35,000 combinations in the current Fusion to 96. "We really offered too many options," Hackett said. Ford also plans to add Internet connectivity in every one of its vehicles in the U.S. by 2019. About 55 percent of its lineup is connected today. By 2020, 90 percent of Ford's new global vehicles will feature connectivity, the company said. The automaker is still exploring how it will commoditize that connectivity and what services it could offer. “I don’t feel that where we are competitively is where we should be,” Hackett said, adding that that could be fixed rather quickly. Ford said it was reaffirming its long-term goal of an 8 percent operating margin on its core automotive business as it looks to boost overall profitability. It also reaffirmed its financial guidance of a $9 billion pretax profit for 2017.